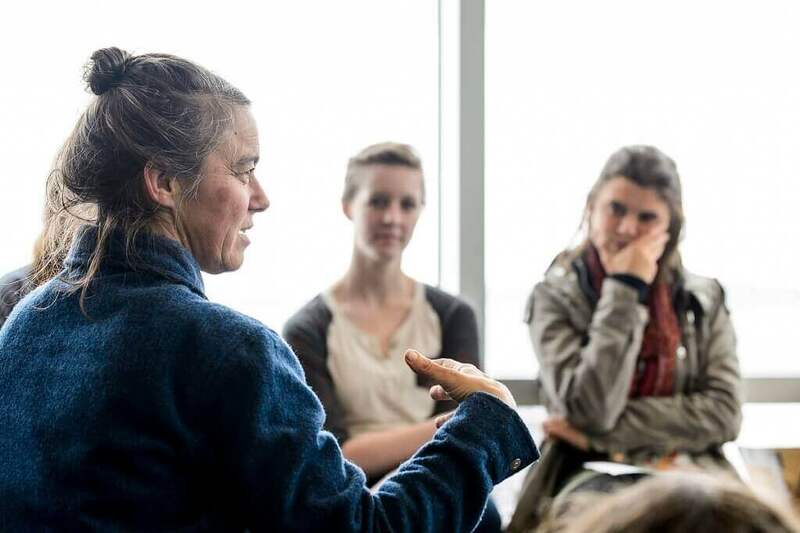 It didn’t take long for the students in Amy Franceschini’s class to realize that this wasn’t going to be your typical art course. A guest speaker, to make a point about changing perspectives, invited the class to “swim” on the floor. It’s moments like this that make Franceschini’s statement, “There’s no typical classroom day,” believable. San Francisco-based Franceschini is the 2016 Interdisciplinary Artist in Residence at University Wisconsin–Madison. 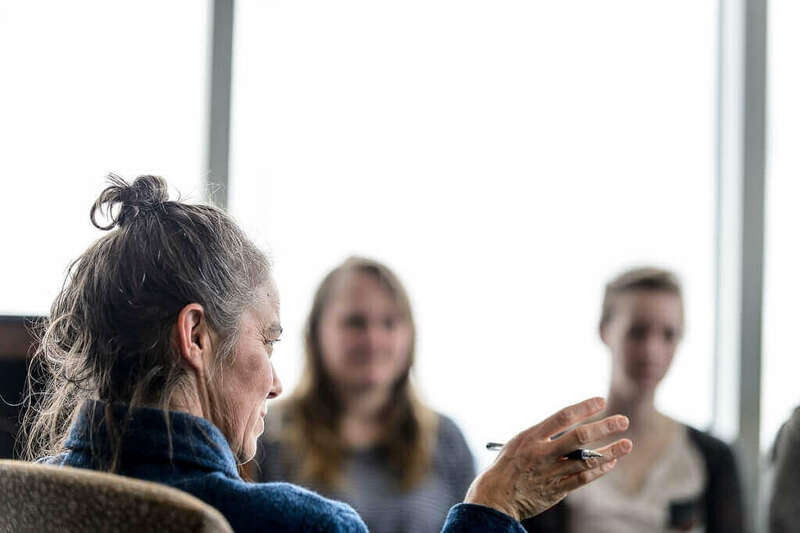 The Interdisciplinary Arts Residency Program enables the Arts Institute to support extended residencies for the benefit of all arts departments and programs of the University. 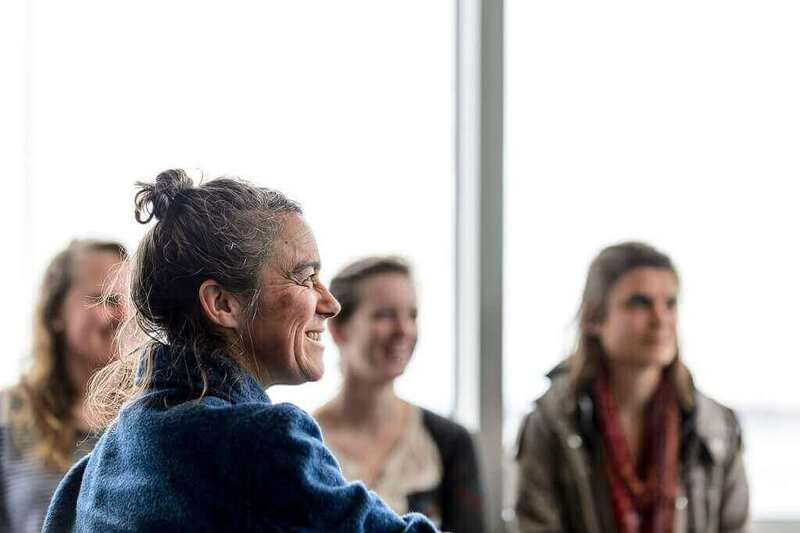 Artists teach an interdisciplinary course for university credit, present at least one free public event and participate in community outreach activities. Franceschini’s class may be unconventional at times — other activities have included students kneading dough between their toes and singing sea chanteys — but it’s teaching important lessons about social change and uncertainty. “I wouldn’t say it’s a class, I’d say it’s more like you’re inside of an art project,” explains Franceschini. That art project is known as Seed Journey, one product of Franceschini’s organization Futurefarmers, a collective that uses art, science, research and activism to address social, political, and environmental issues. Seed Journey will take ancient grains from Norway that have never been patented or industrialized and send them on a sea voyage in September to the Fertile Crescent, considered the birthplace of agriculture. The journey has a distinct message. This partnership has taught students lessons about the value of art as a social practice. “I didn’t realize art could be such an instigator of social change,” says Lyons. 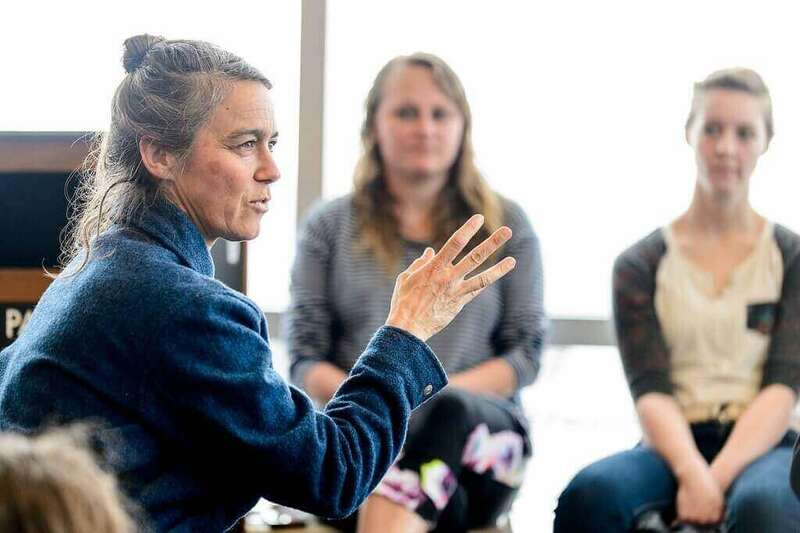 Students aren’t just learning about social practice art; they get to participate in it by putting on an exhibition on April 22 at James Madison Park in Madison that partners with Seed Journey. Some of their projects will be used on the ship’s voyage and some will be solely for the exhibition. For the Seed Journey ship, Rachael Lallensack, a journalism student, is creating a template for daily sailing logs. Hannah Bennett, a graduate student who focuses on textiles and fabrics, is learning how to make fishing nets. Lyons is making informational seed packets explaining their origins and uses. Student projects at the performance will be just as diverse. Leah Garcia, a graduate student in art and printmaking, will choreograph a square dance with patterns based on ocean currents. Ceramist Juliette Walker, combining the grain and nautical themes, will enlist classmates and participants to help her knead an enormous mound of bread, roll it, tie it into sailor’s knots, bake it and eat it. Franceschini also wants to teach her students about time management for performance art, so she suggested they do a trial run of the bread. This meant a class spent kneading a large ball of dough using, after some consideration, their feet. One student still ate it. “It’s the awkwardness we actually liked,” says Franceschini. These kinds impromptu, surprising experiences have run throughout the course. “At the beginning of the class, students would ask, ‘When are we going to know exactly what we’re doing?’ And I was like, ‘Probably never,’” Franceschini says. For the students, this took some getting used to. Lyons says that she values being challenged in this way, as it has taught her to be more comfortable with process. “Process is really the scariest part, because you’re in the sea of the unknown, you know? And if you get unconfident you will sink, and you just have to trust,” Franceschini says. Franceschini values uncertainty because she grew up in the midst of it — with two farming parents, she saw firsthand the unpredictable nature of nature. She classifies farming as an act of improvisation. While things may have been uncomfortable or strange at times, students can point to progress in feeling natural in the absurd. “When you do something that feels unnatural, if you keep doing it, eventually you find a way in, and it starts to be comfortable,” says Bennett. The students are looking forward to passing this lesson on to their audience at the exhibition.